Instead of clarifying my goals as mother, reading multiple parenting guides can often muddy the waters, as many books give contradicting methods and philosophies. Usually, I end up taking a little bit away from every book, some more than others. 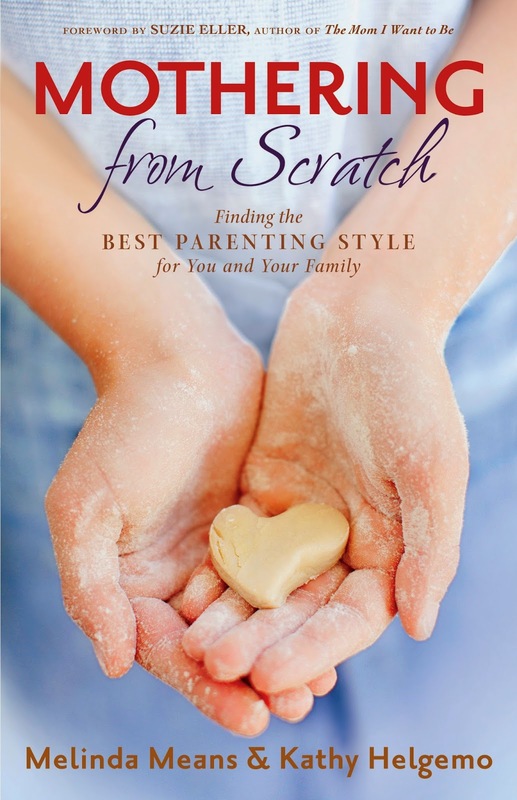 Bloggers Melinda Means' and Kathy Helgemo's new book Mothering From Scratch: Finding the Best Parenting Style for You and Your Family got my hopes up. Here was a book that validated my pick and choose approach to mothering, and promised to help me determine when a certain style or practice was a good fit for me and my family. I think what this book ended up being was Means and Helgemo's recipe for how they've parented from scratch, with little bites of wisdom from all over the body of Christian parenting literature as well as what they've gleaned over time from each other and from their blog community. The book's strengths are in its overall affirming message, the honesty and friendliness of the authors and some very helpful points. However, because of the book's scattered, eclectic format, I didn't feel like it helped me hone in on my best parenting style. I'm giving it 3 out of 5 stars. The authors do provide wisdom culled from their many years mothering and thoughtfully assessing different parenting styles learned from books, other moms and their own mothers. In particular, I was forced to reevaluate myself in the chapter "Mom Mentors: Turning Rivals to Resources," and I plan to pray over the authors' gentle urging to forge one good peer-to-peer mentoring relationship this year. This honest, insightful look into the fallen way we women often mistakenly view our peers as rivals in this quest for perfection was the most helpful part of the book for me. Secondly, the authors' own vulnerability comes through with honesty and humor from the very first pages. I loved the example these two women set for their readers: They come from different social and even denominational backgrounds, yet they've opened their hearts to each other to produce something to help other moms. For readers who don't want to be talked down to and received with open arms, Means and Helgemo offer refreshing voices. Thirdly, I feel the overall emphasis on grace and ditching the goal of being a perfect mom is helpful and healthy for any Christian parent. The final section of the book, "Mothering with Wisdom and Grace," encourage women to make space for "satisfying self-care," including time alone with their Father. Many Christian parenting books assume that readers already know to do this, and focus instead on methods or philosophies or desired outcomes of their brand of parenting. The authors make time in prayer, reflection and Bible study a key component of their mothering recipe. I docked the first star for stylistic reasons; other readers might really like the magazine quality of the book's format with its constant switching between the two authors, testimonies from others, sidebars and pull quotes. I felt distracted and a little annoyed that this, like too many books geared toward moms, assume we all have ADD and can only handle focusing on a particular topic for 20 seconds. The second star I took away is what I feel the root detractor of the book (for me). The book's cover, which features a lovely photograph of flour dusted hands cradling an imperfect, tender heart of dough, has a poetic beauty that drew me in. Perhaps because of the message of many books I've read in the last year-- Kingsolver's Animal, Vegetable, Miracle, Pollan's Cooked, Sweet's From Tablet to Table and Noll's Slow Family Living to name just a few-- I fancied this book might also encourage moms toward slowing down, treasuring little moments with their children and cutting out the chaos of a highly-processed life. But in many places the book actually cuts the other way. For example, they advise moms to stock up on pre-made meals to give them more time for other responsibilities. This wasn't really a big deal; I just misread the cover design. My second unfulfilled expectation was the one I couldn't ignore. The subtitle, "Finding the Best Parenting Style for You and Your Family," caused me to assume the authors might discuss in more depth the main parenting philosophies out there and give pros and cons of each. Perhaps devoting a chapter to each, and including personal testimonies and profiles from real moms who thrived or struggled under those philosophies/strategies to help illustrate why a particular parenting style was or wasn't the best for someone. Obviously, as the book does clearly stress, no one is going to really find that a particular book or philosophy exactly fits their personality and family's needs (unless they themselves author the book!) Therefore, I also imagined a concluding section that gave tips on how to choose the best from various parenting outlooks, how to create that personal style from scratch, using ingredients from all the parenting wisdom out there. Those that liked the book more than I did might argued the authors do provide advice for someone to determine their style, (Take the Myers-Briggs Personality Type Indicator Test! --I'm an INFP, btw), to determine their family's needs (Ask them! ), and drop what doesn't work (If you don't like being crafty, don't do it!) I just felt like what were meant as sage advice were kind of no-brainers. I don't want to end on such a snarky note. Truth is, I'm so far from figuring out this weighty, wonderful adventure of raising three boys. I could and did gain valuable insight from this book, despite having to sift through a bit of clutter in my search to find it.